Agriculture Department Gujranwala has announced New Jobs in Daily Express Newspaper 19/03/2018. Candidates who have required Qualification and Experience may apply for Agriculture Department Jobs 2018 against the vacant posts of Vehicle Driver, Naib Qasid, Chowkidar, Baildar and Sweeper. Candidates should attach Educational Certificates, Domicile, Character Certificate, CNIC and Experience Letter with their application. Successful Candidates will be posted at Adoptive Research Farm Gujranwala, Office Agriculture Farm Training/Adoptive Research Gujranwala, and Office of Research Station Sialkot. 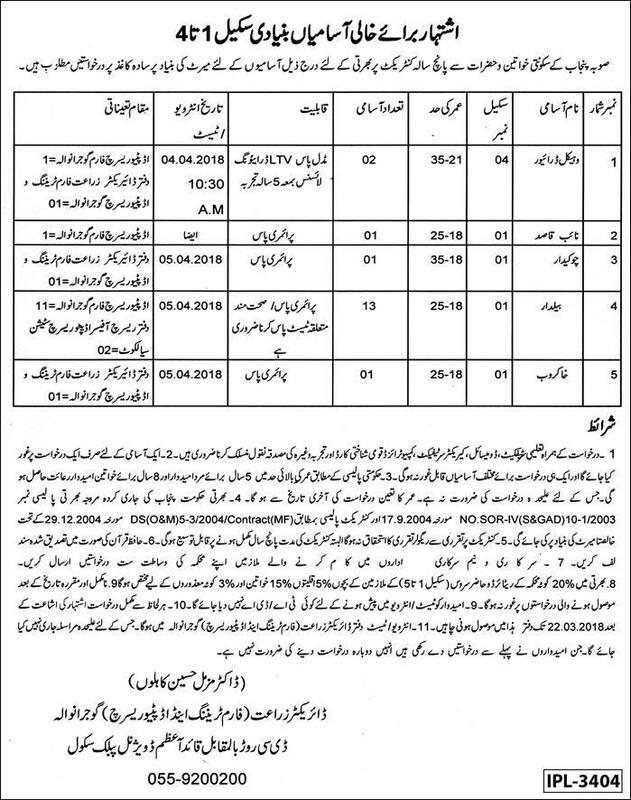 Agriculture Department Gujranwala 18 Jobs Daily Express Newspaper 19 March 2018.